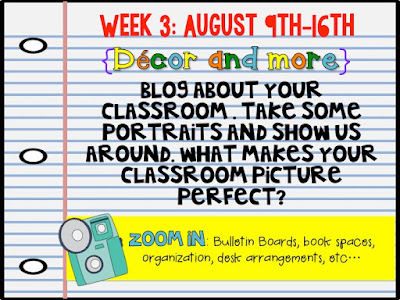 This week's Back to School in a Flash Linky is all about classroom decor! 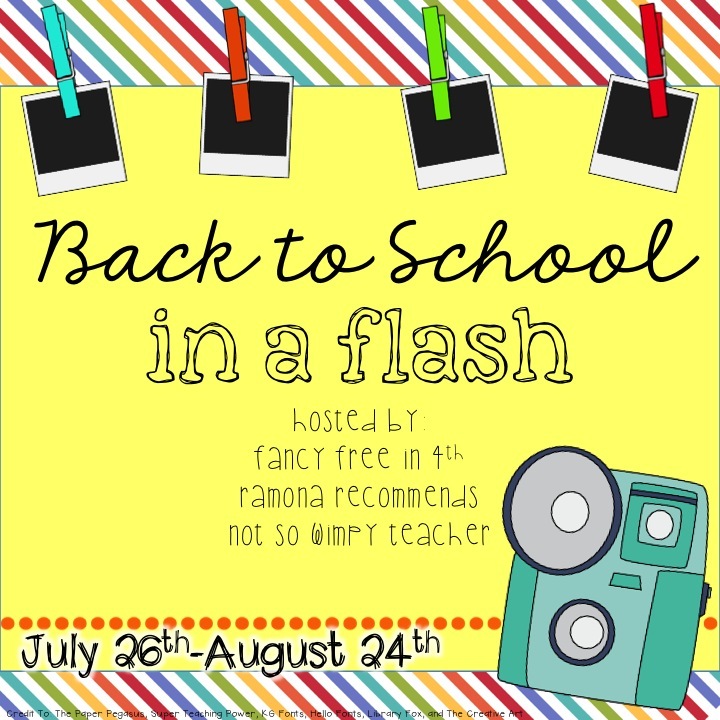 Thank you to Ramona Recommends, Fancy Free in Fourth, and Not So Wimpy Teacher for hostessing this fun linky! We started school on Thursday, so my classroom was pretty much ready for this linky. There are a few things I'm going to tweak this week, but here is what I have so far! I moved into this classroom at the end of May, and spent a few weeks putting things away and decorating. 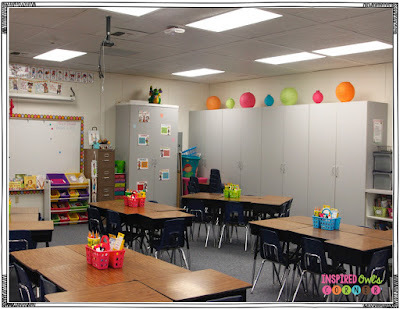 I am still having a hard time finding things, but I do love all of the closet, drawer, and shelf space in this classroom. It is designed for 20 students, even though I have 29. I love my color scheme- aqua, pink, lime green, and orange. To me, it keeps the decor cohesive. This summer I found lots of great baskets and storage at great prices that weren't in my color scheme, but that was no problem, because spray paint has become my bff! Here are two different views of my classroom. This board took me FOREVER to put together! I blogged about how I made the clothespin pushpins here. I used the numbers from my decor set. I planned to use some burlap squares I purchased at Michael's in the scrapbook area, but when I opened the pack, they were frayed and crooked! I knew that wouldn't work, so I went back to Michael's and picked up a set of 12x12 cardstock that matches my decor. 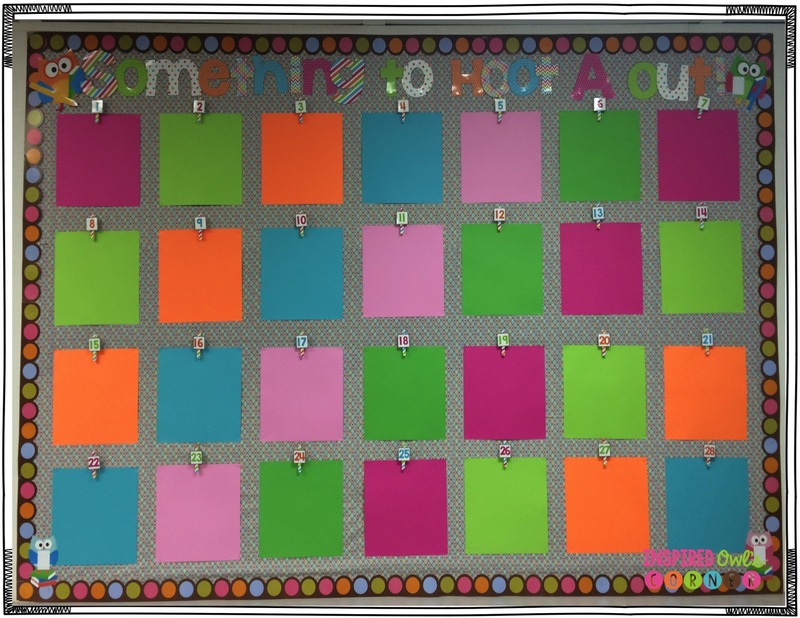 I spent at least and hour putting up each square evenly on the board, with the help of a ruler and my kiddos to tell me when they were crooked. I plan to use this board for student work, and I will switch the work out every few weeks. I'm hoping the clothespins will be much easier than stapling the papers! This year I fell in love with Melonheadz Kids Clipart! I still have a few areas with owls, but these kids have taken over my classroom! They are absolutely adorable! I gave my character file a huge makeover and a new name, and now it's called Character Kiddos and Critters. The picture above are the posters that are included in the file. 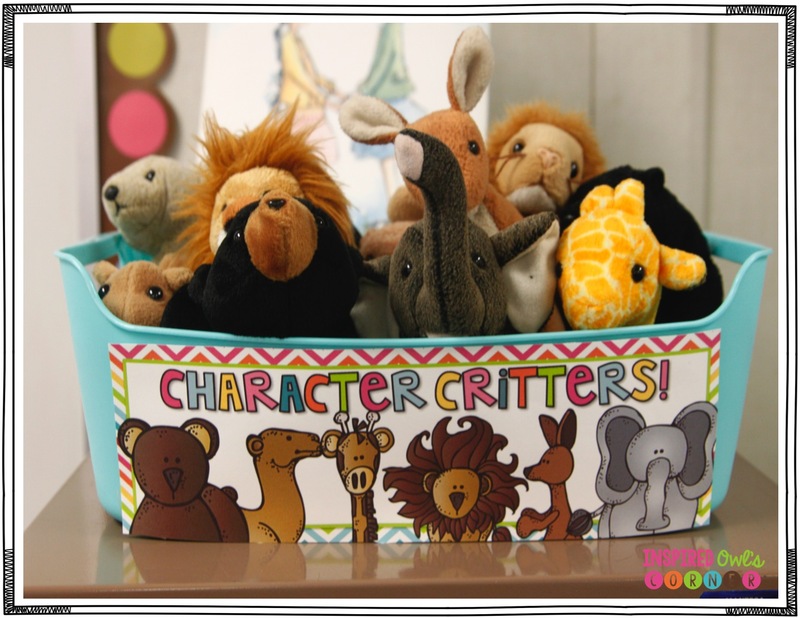 The animals below match the posters and the students who exhibit the character traits each day will get to keep the corresponding animal on their desks the next day. I plan to blog more about this pack and how I use it. 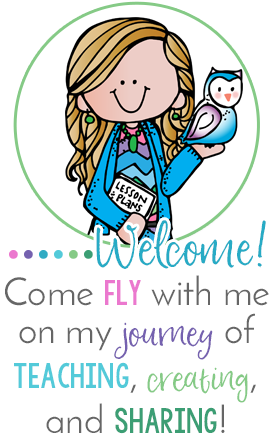 It does include a few other items such as awards, brag tags, and treats for your kiddos with character. 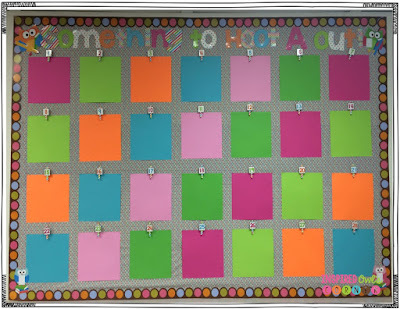 I'm in LOVE with my classroom jobs board! 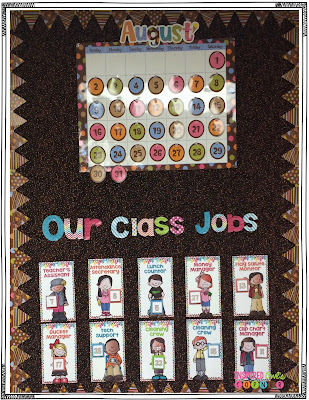 Each job poster has a kiddo holding a square, and in that square you place your students' numbers. I also have an editable set so you can add your own jobs and student names, if you would rather use those instead of numbers. I used magnet strips on the backs of the numbers so I can easily change them out each week. I'm hoping this set up keeps things more organized for me this year! 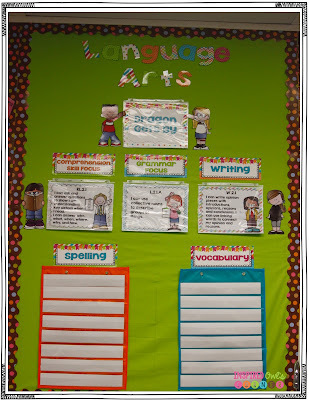 This is my language arts focus wall so far. 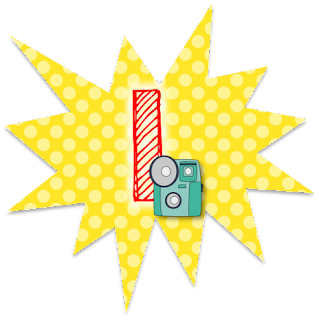 I think my plan is going to be to put the letters on a banner and hang them up a little higher, then move up my story title a bit. 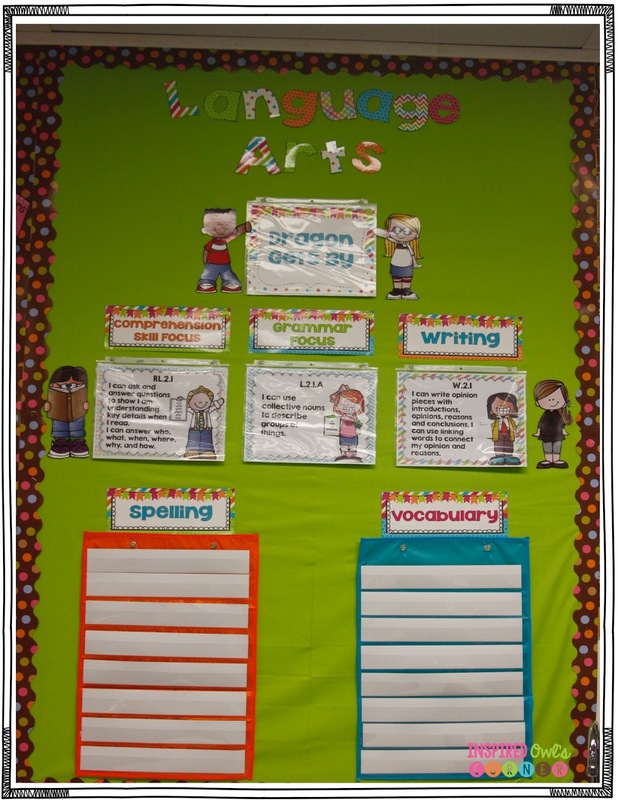 I'm going to add comprehension posters to the top, but this is the basic layout of my ELA board. 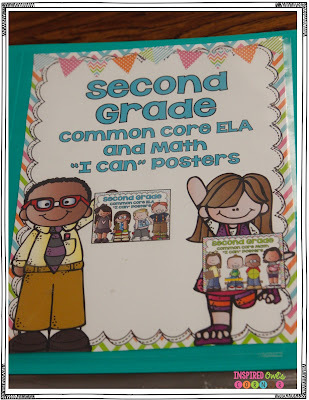 This year I made Common Core "I Can" posters in brights to match my board. 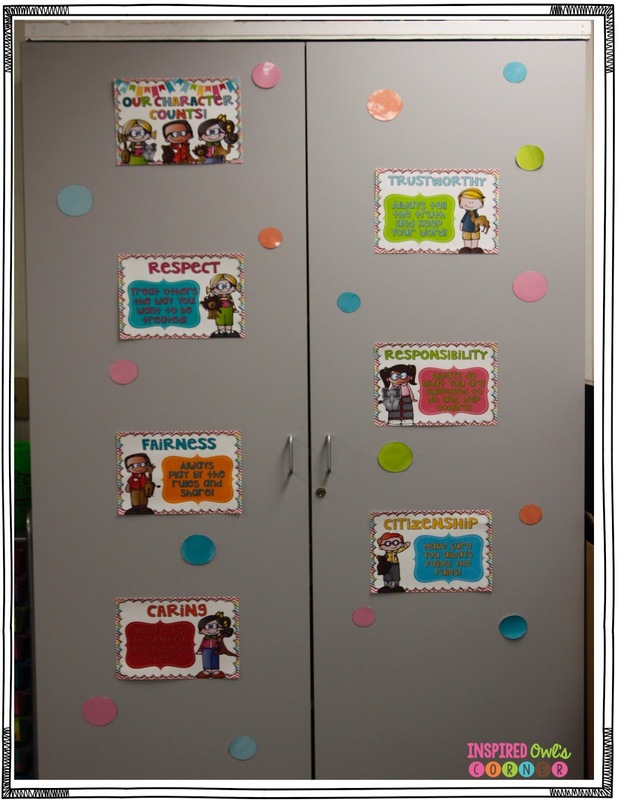 I love these posters because they are not only a decor item on my board, they help to keep me organized with the standards, which will be mandatory to use this year. I have second grade with kids here, and third grade with kids here. 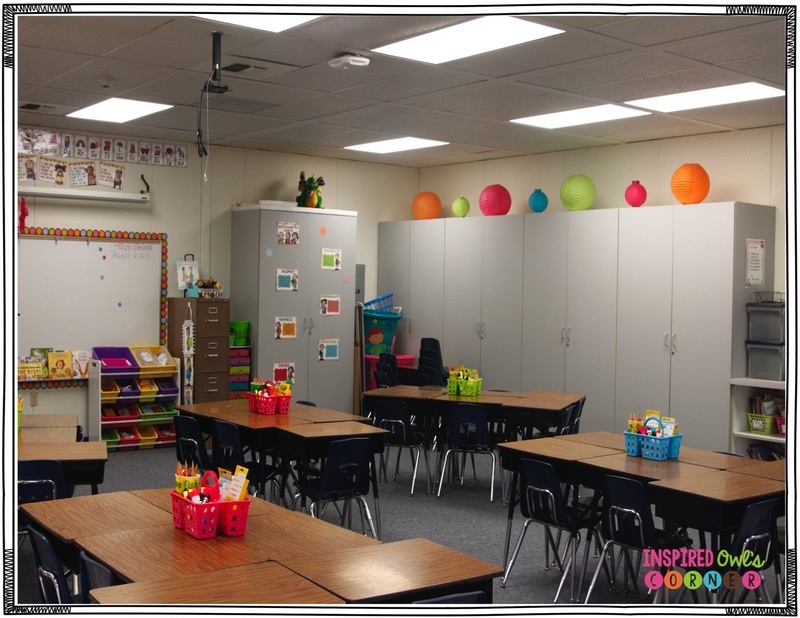 I have an owl set for second grade here, and an owl set for third grade here. 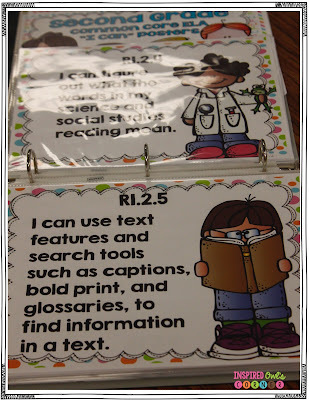 I organize them in a binder and just switch out the pages each week based on the standards I'm teaching. It's so easy to stay organized and on top of things this way! 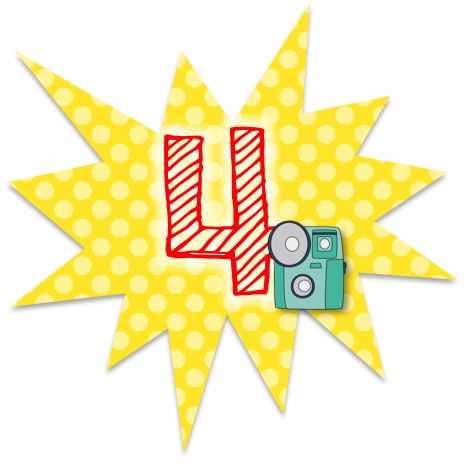 Now it's your turn! 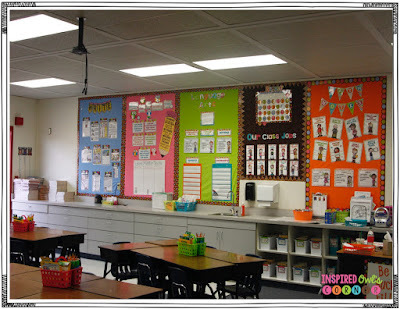 Blog about your classroom decor and link up with us below! Everything looks great! I love the bright colors! Please let me know when you make a 4h grade I can set! I will be your first cha-ching! Thanks for linking up! Hope you had a great first "week"- starting school on a Thursday sounds lovely! 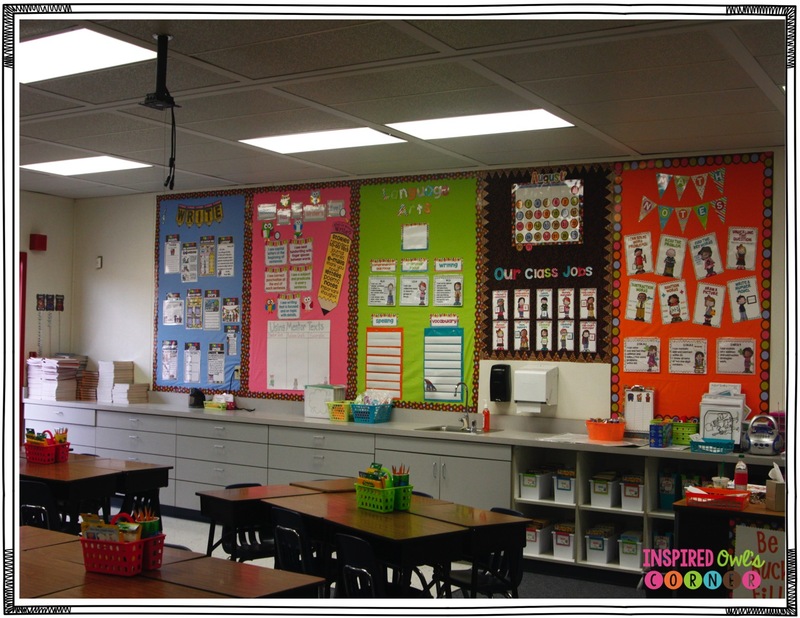 I love the bright colors in your classroom. 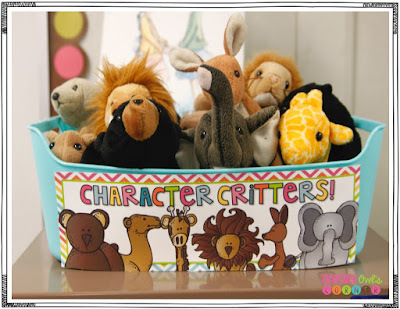 The character critters are so cute! Wish I had saved my Beanie Babies!